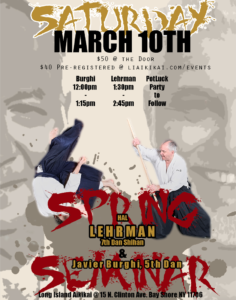 Join us for this special seminar with Hal Lehrman, 7th Dan, Shihan and his student Javier Burghi Sensei, 5th Dan. Lehrman Sensei has studied Aikido under Yoshimitsu Yamada Sensei and other talented instructors since 1963. In 1976, Lehrman Sensei began teaching in Brooklyn where he now runs Aikido of Park Slope. Javier Burghi Sensei has been practicing Aikido since 1990. Since then he has trained with many great instructors such as Yamada Sensei, Sugano Sensei, Harvey Koinsberg Sensei and Donovan Waite Sensei. In March 1997 he started training under Hal Lehrman Sensei and has been a student of Aikido of Park Slope ever since.